Azerbaijan is located in Southwestern Asia, bordering the Caspian Sea, between Iran and Russia, with a small European portion north of the Caucasus range, comprising of 86,600 sq km. It has a population of 7,911,974 (2005). 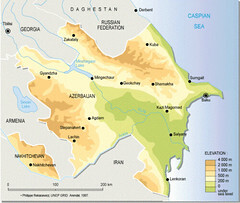 Major environmental concerns are: local scientists consider the Abseron Yasaqligi (Apsheron Peninsula) (including Baku and Sumqayit) and the Caspian Sea to be the ecologically most devastated area in the world because of severe air, soil, and water pollution; soil pollution results from oil spills, from the use of DDT as a pesticide, and from toxic defoliants used in the production of cotton.